Organic Healthful Herbs, Spices & Seasonings Selection. > Exclusive Organic English Mixed Spice. Exclusive Organic English Mixed Spice. Traditionally used for our British faire such as Christmas cakes, rock buns, hot cross buns and fruit cakes. The sweet blend contains health promoting fresh, organic spices such as cinnamon, coriander, allspice, ginger, nutmeg and cloves. Making this delicious blend up fresh helps contain the potency of the spices. I make small batches that are bursting with many health properties, flavour and taste. This old fashioned recipe was something I was brought up on. My Gran was a top rated cook who worked as a young girl in some of the most elite manor homes and refined estates, she worked with some of the top chefs in our county and probably in the country, she only learnt from the very best. and used English mixed spice in many of her delicious fruit cakes and rock buns, there was no taste quite like them. You can "Americanize" your self by using it on cream cheese, muffins, toast and as you would pumpkin spice. Organic blends of cinnamon, coriander, allspice, ginger root, nutmeg, and cloves. 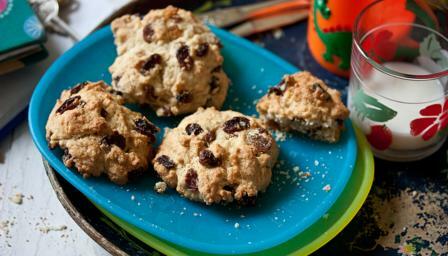 Try these light, crumbly tea-time favourites while they are still warm from the oven. So easy to make, and lots of fun for children to join in too. 1 tsp English Mixed Spice. Add the egg mixture to the dry ingredients and stir with a spoon until the mixture just comes together as a thick, lumpy dough. Add a teaspoon more milk if you really need it to make the mixture stick together.